Swimming at Heritage Park on Saturday, both Boulder City High School swim programs were dominant against 4A opponent Las Vegas. Laura Hubel/Boulder City Review Aimee Garcia, a junior at Boulder City High School, swam a 2:16.56 earning first place and eight points for the Lady Eagles in the 200 individual medley during their meet Saturday against Las Vegas High School. Nichole Del Rio/Boulder City Review Boulder City High School sophomore Preston Jorgensen prevents the Green Valley Gators from scoring during a game Monday. The Eagles lost the match 3-0. Cruising past the Wildcats with ease, the Lady Eagles won all eight individual events to finish with a 211-45 victory. 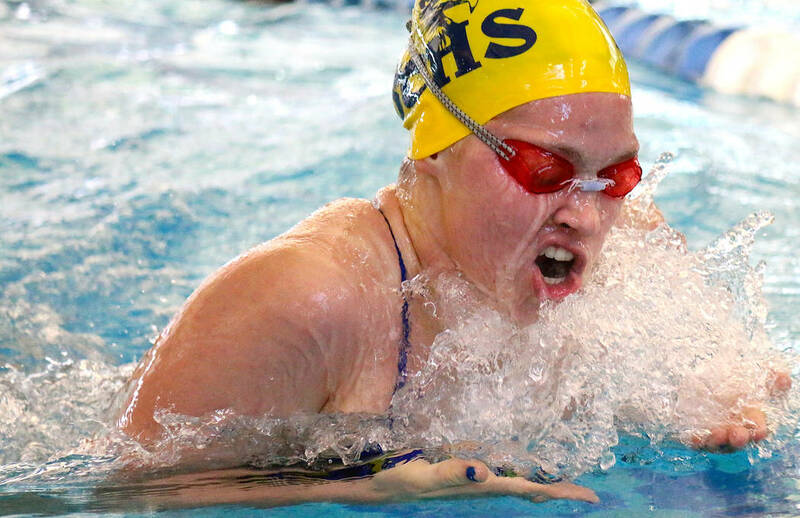 Juniors Annika Freiburger and Aimee Garcia led the way with each winning a pair of events. Accounting for three wins, sophomore Quinci Thomas placed first in the 100-yard butterfly (1:05.35) and 500-yard freestyle (5:31.25), while sophomore Tegan Pappas placed first in the 50-yard freestyle (27.60 seconds). Freshman Daphne Thompson rounded out the winning effort with a first-place finish in the 100-yard backstroke with a time of 1:06.06. Winning by a closer margin, the Eagles defeated the Wildcats 168.5-110.5 behind seniors Clayton Pendleton, first in the 100-yard butterfly (1:01.91), and Robbie Leavitt, first in the 100-yard breaststroke (1:12.85). Claiming five individual events overall, junior Chandler Larson placed first in the 100-yard backstroke (1:00.03), while sophomore Alejandro Garcia placed first in the 100-yard freestyle (58.47 seconds). Freshman Joseph Purdy placed first in the 200-yard individual medley (2:13.44). Hoping to remain unbeaten during the regular season, both programs will host 4A Eldorado on Saturday at the Municipal Pool in Las Vegas. 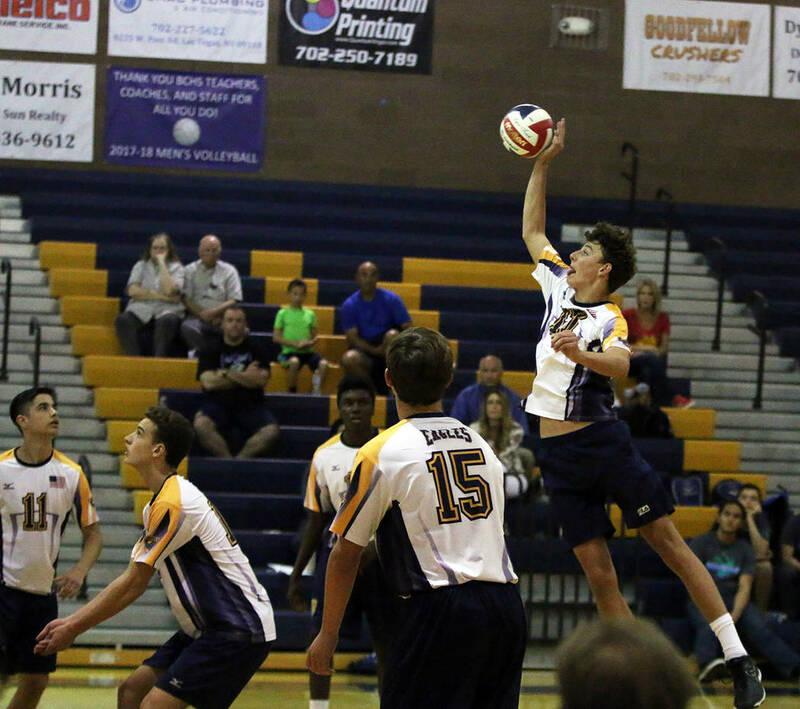 Despite being swept in their three-game slate against 4A opponents, Boulder City High School boys volleyball team shows promise that it can handle itself against the state’s top competition. Falling 3-0 to Desert Oasis on April 4, the Eagles held tough with the Diamondbacks, nearly forcing extra sets in their 27-25, 25-14, 26-24 loss. Effective offensively, sophomore Preston Jorgensen tallied 14 kills, while junior Karson Bailey added 10 kills. Jorgensen also added four assists and three blocks defensively, while Bailey added two assists and blocks each. Sophomore Boen Huxford added 19 assists, three blocks and two kills. Having a tougher time with Rancho on April 5, the Eagles lost 25-12, 25-15, 25-20, while falling to Green Valley on Monday, April 9, 25-22, 25-12, 25-14. Against Rancho, Huxford tallied 12 assists, while Jorgensen added 10 kills. Having a breakout game, Dylan Leasure recorded 11 digs defensively with four kills. Against Green Valley, Bailey had nine kills, while Huxford tallied eight assists. The Eagles (1-8) will travel to 4A Eldorado on Friday, followed by a road game at 3A Chaparral on Monday and 4A Silverado on Tuesday. Boulder City High School boys golf team stayed undefeated in 3A Sunrise League play April 4, defeating Chaparral (422) and Virgin Valley (436). Finishing with an overall team score of 354, senior Jackson Wright and freshman Blake Schaper tied for first at Las Vegas National with overall scores of 82. Freshman Kyle Carducci tied for fifth with a score of 96, while Chase Hamel finished eighth with a score of 101. Continuing to prove they’re one of the best teams in Southern Nevada regardless of classification, the Eagles defeated 4A Green Valley 162-216 on Monday, April 9, at Legacy golf course. Gaining strong contributions from their starting four, junior Kevin Phelps finished first with a score of 39, followed by Wright (40), Carducci (41) and Blake Schaper (42). The Eagles will host a match today at Boulder Creek. Finding success in California on Saturday, Boulder City High School boys track team finished fourth out of 15 programs at Ocean View High School, with an overall score of 60.5, trailing Rancho Alamitos (88), Ocean View (83) and Rosemead (71). Senior Zach Trone finished first in the 100-meter dash (11.37 seconds) and long jump (20-6), while finishing second in the 200-meter dash (22.97 seconds) and triple jump (42-11). Senior Buddy Biggs placed third in the pole vault (11-6) and sixth in the high jump (5-6), while senior Bryce Rogers placed sixth in the pole vault with a leap of 10 feet. Rounding out the Eagles’ core, sophomore Justice Tilman placed seventh in the 110-meter hurdles (20.70 seconds) and 300-meter hurdles (46.54 seconds), while finishing 10th in the 400-meter dash with a time of 57.82 seconds. Finishing in the top half as well Saturday, the Lady Eagles placed sixth out of 17 programs with an overall score of 53. Senior Sierra Selinger set a person best placing first in the 3200-meter run with a time of 12:09.91. A top points earner for the Lady Eagles, Selinger also finished fourth in the 1600-meter run with a time of 5:41.46. Finishing as the top pointers earner for the Lady Eagles, junior Geri Wachtel place in the top five in all four of her events. She finished second in the high jump (4-8), third in the 100-meter hurdles (18.10 seconds), fourth in the triple jump (30-8) and fifth in the 300-meter hurdles (56.62 seconds). Finishing first in discus, senior Maggie Roe set a personal record with a heave of 96-6, while senior Kamryn Dolph placed sixth with a toss of 77-8. Senior Hannah Miller finished seventh in the 400-meter run (1:09.84) and 10th in the long jump (13-3). Back to racing against Nevada opponents, the Eagles travel to Western today, followed by the Blaine Thompson-Las Vegas Track Classic at Desert Oasis on Friday and Saturday. Saturday, April 14, vs. Eldorado at Las Vegas Municipal Pool, 9:45 a.m.
Today, April 12, Western Meet at Western, 3:30 p.m.